The large black MILWAUKEE M12 Heated AXIS jacket kits are designed to protect from cold and weather on the jobsite. Powered by M12 REDLITHIUM Battery Technology, these heated jacket kits use carbon fiber heating elements to create and distribute heat to the chest, back and shoulders. A single touch LED controller heats up the battery heated jacket to three heat settings, creating a comfortable heat for any environment. This MILWAUKEE heated jacket kit has a new Quick-Heat funtion that creates and distributes heat three times faster than our previous jackets and market competitors. Hybrid AXIS Ripstop Polyester provides a lightweight, compressible design that can be used as an outer shell or a mid-layer jacket and provides wind and water. This kit comes with one heated jacket, an M12 battery and charger. Powered by the revolutionary M12 REDLITHIUM battery, the M12 Cordless LITHIUM-ION Black Heated Jacket delivers comfort and heat in cold weather conditions. This jacket utilizes new cold weather technology to actively warm the body and stimulate blood circulation. Three carbon fiber heating zones distribute heat to core body areas, with a stylish performance-fit that gives users maximum flexibility and comfort during use. The 2336 M12 Black Heated Jacket features three heat settings for varying heat needs, and is water and wind resistant for a variety of weather conditions. Available in sizes ranging from S - 3XL. Battery and charger included. 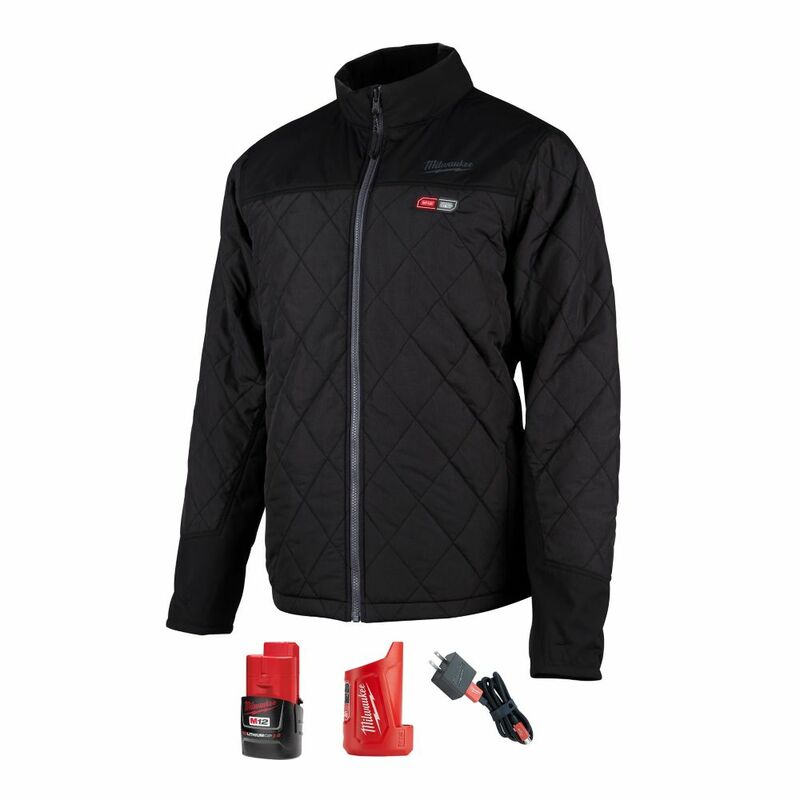 Men's Large M12 12-Volt Lithium-Ion Cordless AXIS Black Heated Quilted Jacket with (1) 2.0Ah Battery The large black MILWAUKEE M12 Heated AXIS jacket kits are designed to protect from cold and weather on the jobsite. Powered by M12 REDLITHIUM Battery Technology, these heated jacket kits use carbon fiber heating elements to create and distribute heat to the chest, back and shoulders. A single touch LED controller heats up the battery heated jacket to three heat settings, creating a comfortable heat for any environment. This MILWAUKEE heated jacket kit has a new Quick-Heat funtion that creates and distributes heat three times faster than our previous jackets and market competitors. Hybrid AXIS Ripstop Polyester provides a lightweight, compressible design that can be used as an outer shell or a mid-layer jacket and provides wind and water. This kit comes with one heated jacket, an M12 battery and charger. Men's Large M12 12-Volt Lithium-Ion Cordless AXIS Black Heated Quilted Jacket with (1) 2.0Ah Battery is rated 4.5 out of 5 by 33. Rated 4 out of 5 by After10 from This is a great jacket. Very comfortable to wear while working. I think the high setting could be... This is a great jacket. Very comfortable to wear while working. I think the high setting could be a little warmer. Rated 5 out of 5 by Woods from Great jacket! Warm and well constructed. ... Great jacket! Warm and well constructed. Rated 5 out of 5 by HomeDepotCustomer from I love the jacket. It's light and heavy duty at... I love the jacket. It's light and heavy duty at the same time.